Everyone in town knows Figaro. Whether you need a quick shave, a new hairdo, or an elaborate scheme to win over the love of your life, Figaro is your man. Widely considered the crown jewel of all opera comedies, The Barber of Seville is rapid-fire and razor-sharp, with a hit parade of tunes that will leave everyone whistling. Sunday, January 19 at 2 p.m.
Wednesday, January 22 at 7:30 p.m.
Saturday, January 25 at 4:30 p.m.
Thursday, January 30 at 7:30 p.m.
Saturday, February 1 at 7:30 p.m.
Sunday, February 2 at 2 p.m.
Tuesday, February 4 at 7:30 p.m. 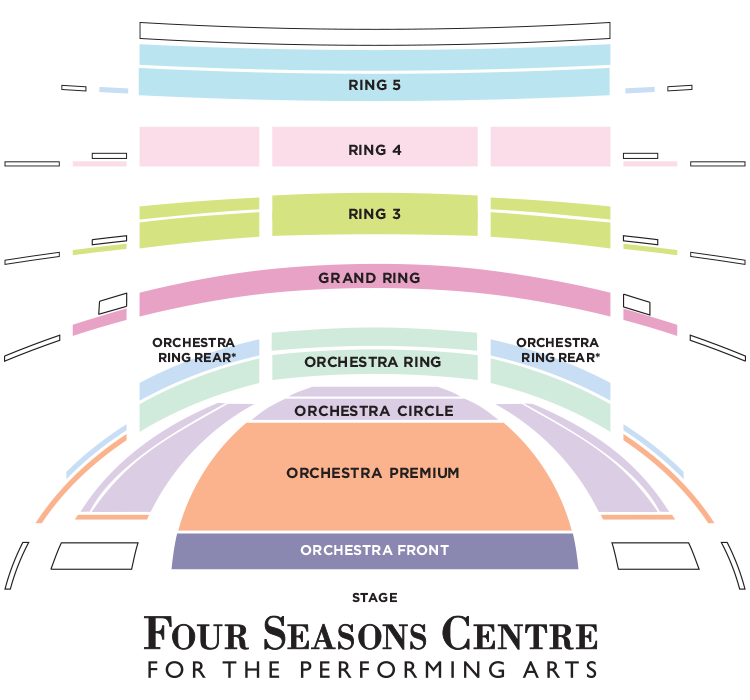 Performance time is approximately two hours and 55 minutes, including one intermission. Young Count Almaviva is in love with Rosina, a virtual prisoner in the home of her aged guardian, Doctor Bartolo, who is plotting to marry her himself. 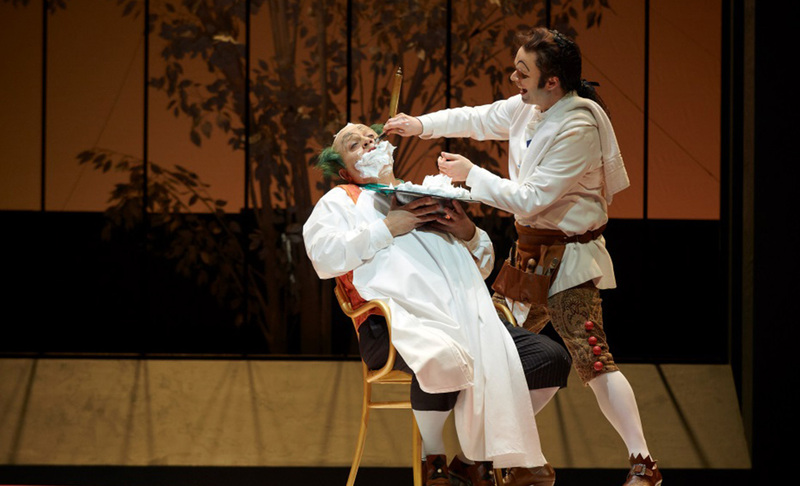 Almaviva hires the services of Seville’s favourite barber and schemer, the irrepressible Figaro, to help him out. Count Almaviva has fallen in love with Rosina, a young girl he saw in Madrid, and has followed her to the house in Seville where she is kept sequestered by her old guardian, Dr. Bartolo, who wishes to marry her and acquire her dowry. Accompanied by his servant Fiorello and some musicians, Almaviva comes in disguise to serenade her, but gets no response. As daylight breaks, the barber Figaro appears and promises to help Almaviva for a suitable reward. Serenading Rosina again, the Count identifies himself as a poor man named “Lindoro” because he wants her to love him for himself, not for his wealth. Figaro comes up with an idea: the Count should force entry into Bartolo's house on the pretext of being a soldier billeted there. The two happily contemplate their respective rewards. Meanwhile, Rosina, stirred by this most attractive voice, determines to find its owner. Bartolo enters with the music master Don Basilio, who warns him that Almaviva is his rival for Rosina's hand. Bartolo decides to marry his ward at once, but Figaro overhears and warns Rosina, promising to carry a letter from her to Lindoro. The suspicious Bartolo tries to get Rosina to admit she has written to her suitor and warns her not to trifle with him. Suddenly Almaviva, disguised as a drunken soldier, bursts in and passes Rosina a note, which she hides. A loud quarrel ensues when Bartolo claims exemption from billeting orders. As a curious crowd forms outside, police try to take the troublemaker into custody, but he confides his identity to the Sergeant, who lets him go amidst pandemonium. Dr. Bartolo suspects the intruder was a spy sent by Almaviva, who once again appears in disguise, this time as Don Alonso, a music teacher substituting for a sick Basilio. Alonso announces he is staying at the same inn as Almaviva and has found a letter from Rosina. He offers to tell Rosina that Almaviva is cheating on her with another woman. Reassured, Bartolo allows Alonso to give Rosina her singing lesson. Bartolo observes the lesson until Figaro arrives to shave him. With Bartolo unable to decide whom to trust alone, Figaro manages to steal the key to the upstairs balcony and Rosina recognizes Lindoro, who proposes to her. As the shaving is about to begin, Basilio himself appears, and the sham threatens to unravel. Quickly, Almaviva bribes him to play sick and rushes him out of the house. Figaro shaves Bartolo, distracting him while the lovers make their plans to elope, but Bartolo overhears the word “disguise” and sends for Basilio. After everyone has left, the maid Berta wanders in and complains that she is working in a madhouse. Learning that Alonso is a fraud, the doctor sends Basilio to fetch a notary at once so he can marry his ward that very evening. Calling Rosina, he shows her a note, saying Lindoro has deceived her and plans to win her for his master, Almaviva. Rosina is angry and agrees to marry Bartolo, also revealing that Figaro and Lindoro plan to enter by way of the balcony. Bartolo goes for the police. Figaro and Almaviva come in through the window, only to be spurned by Rosina, who accuses Lindoro of wooing her for Almaviva. Lindoro reveals his true identity and Rosina is delighted. Figaro urges them to hurry, but as they prepare to escape, they realize Bartolo has thwarted their plan by removing the ladder from the balcony. Basilio enters with the notary, but is dismissed with another bribe from the Count, who joins Rosina in signing the marriage contract. Bartolo surprises them, but is too late to intervene. Rosina is free at last; young love has won the day. 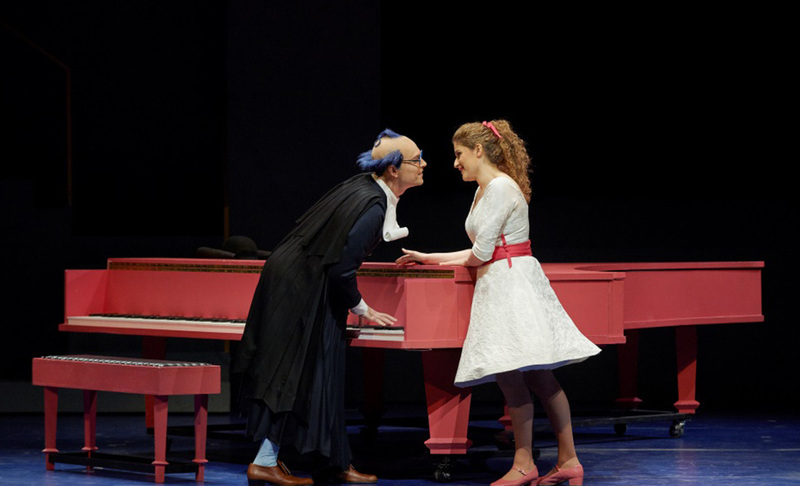 (Top to bottom, left to right): All production photos from the Canadian Opera Company's Barber of Seville, 2015, Alek Shrader as Count Almaviva and Serena Malfi as Rosina; Renato Girolami as Doctor Bartolo and Joshua Hopkins as Figaro; Alek Shrader as Count Almaviva (far right); a scene from the Canadian Opera Company's Barber of Seville, 2015. All photos: Michael Cooper. 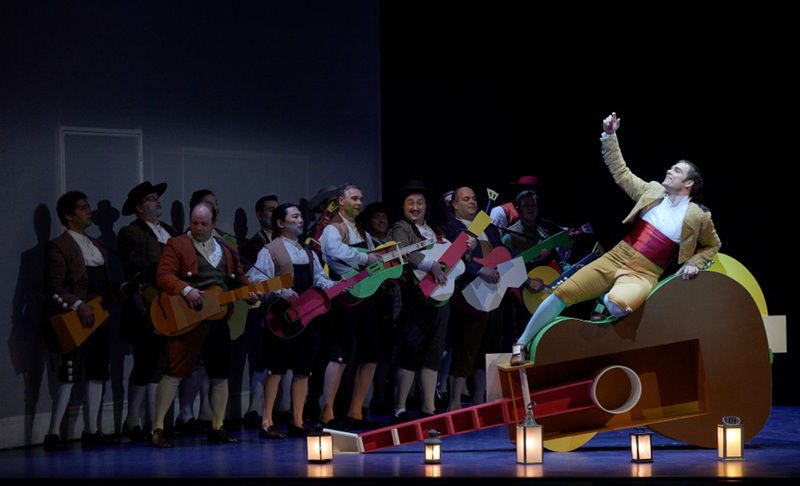 Watch select scenes from the Canadian Opera Company’s colourful 2015 production of The Barber of Seville, Rossini’s classic comedy. 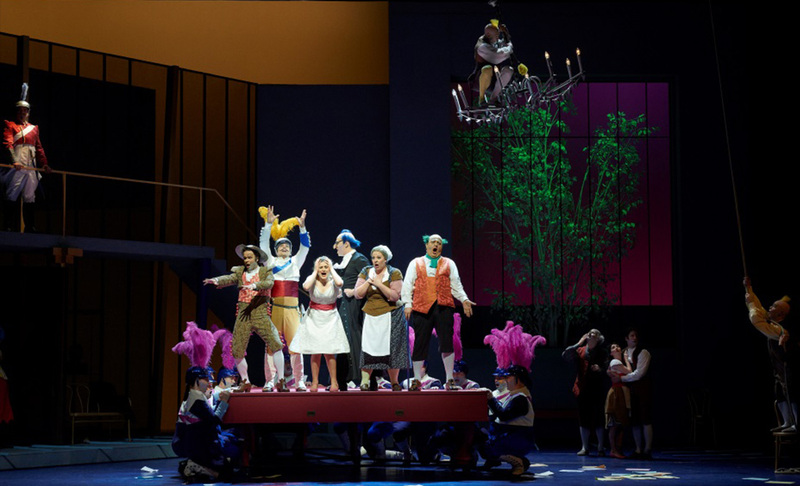 Ahead of the Canadian Opera Company's 2015 production of The Barber of Seville we spoke with Joshua Hopkins (Figaro) and Alek Shrader (Almaviva) about their preparations for Rossini's classic comedy.